Star Wars Gamers that will be attending Celebration Orlando next month will have a lot to look forward to thanks to the latest announcement from Lucasfilm and EA earlier today. The Star Wars Show announced today that Electronic Arts will be bringing a collection of their Star Wars games to the convention. Fans of Star Wars: The Old Republic, Star Wars Battlefront and Star Wars: Galaxy Of Heroes will surely be treated to some awesome experiences, And if you're a mobile gamer, be sure to head to EA's booth on the show floor to play games like Star Wars: Force Collection, Star Wars: Galaxy of Heroes, and Star Wars: Pinball. 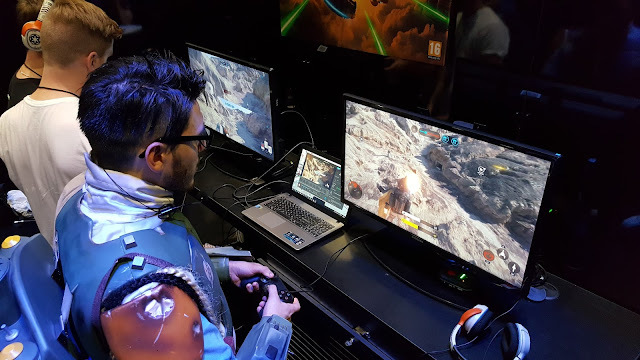 Avid players of The Old Republic will also want to check out the Cantina event happening off-site which will allow you to meet the designers behind the game. While no official announcements have been made yet, I'm sure we'll also learn a lot more about Star Wars Battlefront 2, which is due for release later this year. Star Wars Celebration Orlando kicks off April 13th - 16th in Orlando, Florida!